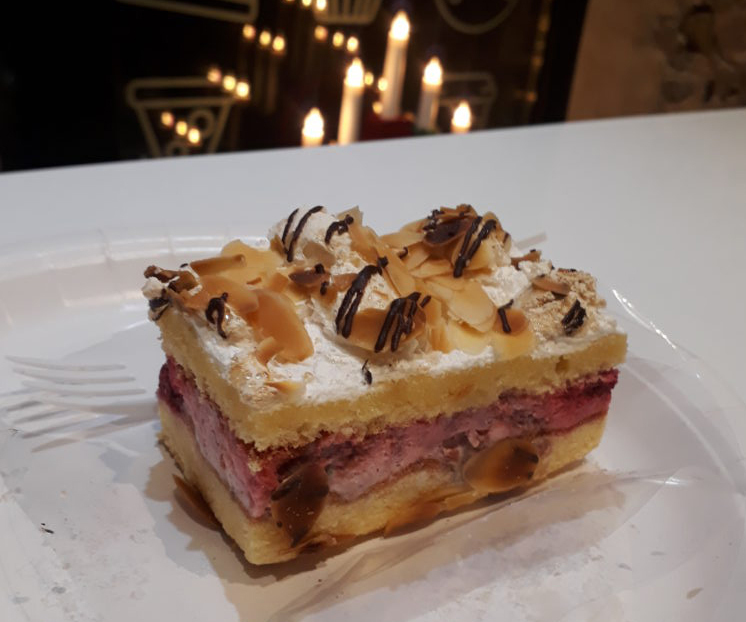 Welcome back to my project of slowly reviewing all the coffee and cakes in Tallinn with my friend Greta, this week: simple delights in Rotermann. 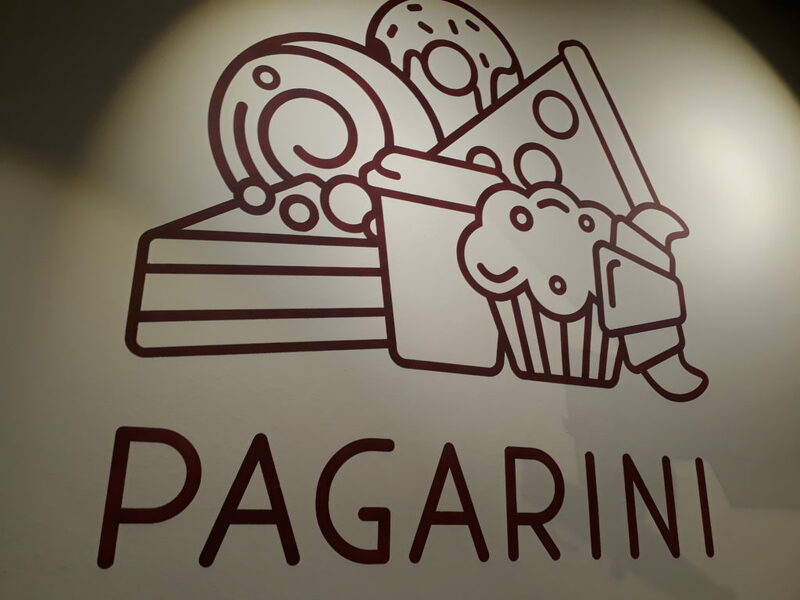 Pagarini has three locations in Estonia, one in Balti jaam turg, one in Tartu, and this one is in Rotermann Quarter. Rotermann Quarter is a pretty quaint part of downtown with old industrial / factory buildings. In order to get to Pagarini you simply take any tram and almost any bus to the Hobujaama stop and walk down the street. The space only holds about 6 people in total and the seats are more 1950’s counter than real sit down style cafe but it’s sufficient if it’s too cold to take your confection and coffee outside. Because we were there in December the shop was decorated to the teeth with trees, glitter, tinsel, candy canes, and other Christmas sundry but I was happy to note that it still smelled simply of sugar and butter like any other cafe with no extra artificial smells added. 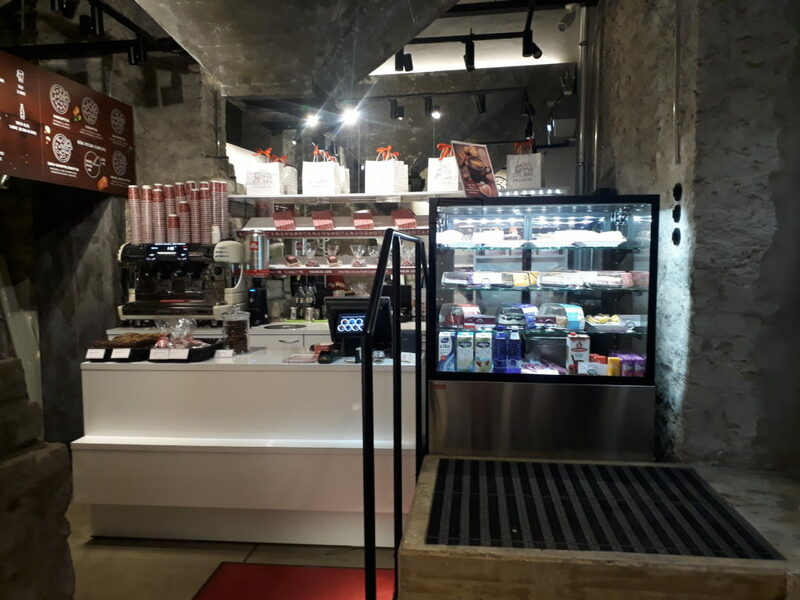 The major downside is that they don’t seem to assume that anyone would bother to stay in the store to eat so they don’t appear to have any real cups so you simply get a paper cup with your coffee. 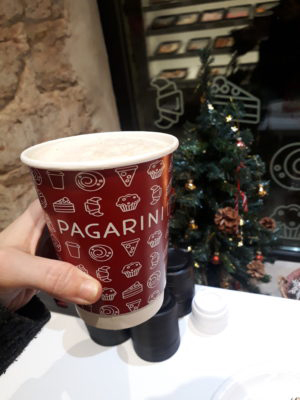 But funny enough, despite not getting coffee in a nice fancy mug, the coffee was actually very good (I expected it to be closer to gas station quality because it came in a paper cup and that’s half because of personal bias and half because it was surprisingly cheap). I got the Brita Cake. I wasn’t aware of this type of cake before moving here but I see it pop up all the time now and it’s a rather good cake and this one was just right. It’s whipped cream or vanilla mousse mixed with raspberries between the two layers of meringue usually though sometimes you get more of a sponge cake instead of a straight meringue (like this one). This cake was topped with toasted almonds, drizzled sugar syrup, and even a bit of chocolate. Despite my absolute love of cream, this cake was not simply a mouthful of cream with a hint of other things but a very balanced creation that was not very sweet. The almonds on top really added a lot of texture since the cake part wasn’t a crisp meringue. I think this is the best brita cake I’ve had yet just because it wasn’t too tart or too sweet or too creamy. Greta had the Chocolate Brownie. This thing was dense. 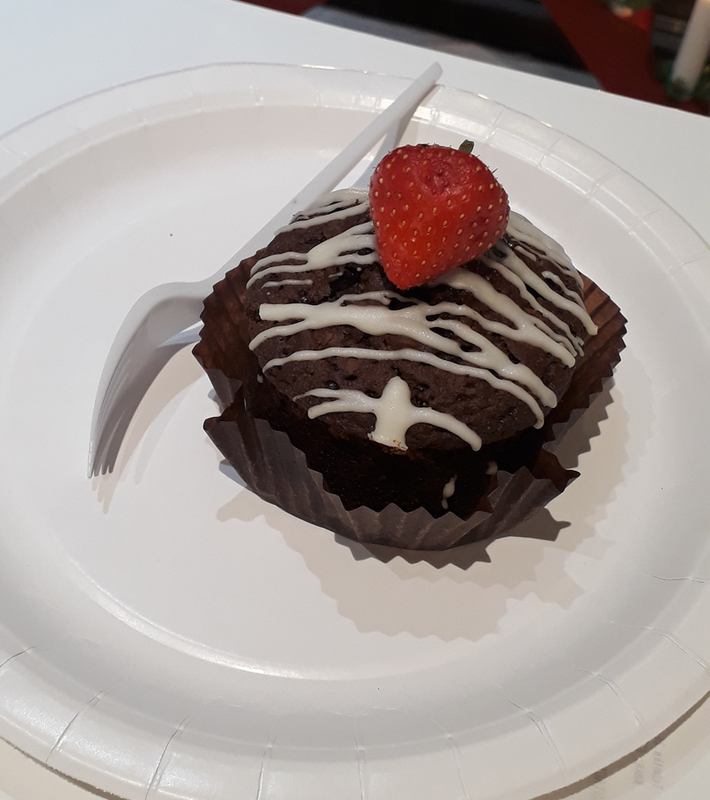 I know it’s all a matter of personal taste but that’s not how I like my brownie but Greta enjoyed it for it’s rich chocolatey and fudge-like quality. There is something that is just good and simple about a brownie and this perfectly adorned one really fit the bill but if you’re like me and you’re looking for a soft, cake like brownie you’ll have to give this a pass. The service was really great. We managed to totally embarrass ourselves while ordering in Estonian, knock over the coat rack (twice!) and I fell off the stool once and the little old lady running the store just reacted like we were charming instead of human disasters which is just a lot of pluses in my book. They played Christmas music but it was December so I’ll try not to hold it against them! Overall, this is a pretty good bakery but it doesn’t function as real cafe due to its size and set up. I’ll be interested in going to the two or three other cafes that are around to see if they’re able to work with the confined space to make them more classically cafe-like but the choice of items is really good and the two cakes we had were satisfying and that’s the most important thing.